If you aren’t optimizing your landing page for conversions, you’re leaving big money on the table. In scenario A you create a landing page that converts at 21%, which is about average. For scenario B you follow the guidelines in this article and your conversion rate jumps up to 42% immediately. Our landing pages consistently convert much higher than that as you’ll see in the Opportunity Zones webinar landing page example, but we like to be conservative with our projections. The first landing page creates 21 leads for every 100 visitors. The optimized page creates 42 leads with the same number of visitors! Think about your yearly lead flow… Now think about the difference in your business if you had twice as many leads without paying more on ads. BTW, the Opportunity Zones landing page gets a whopping 86% conversion rate! 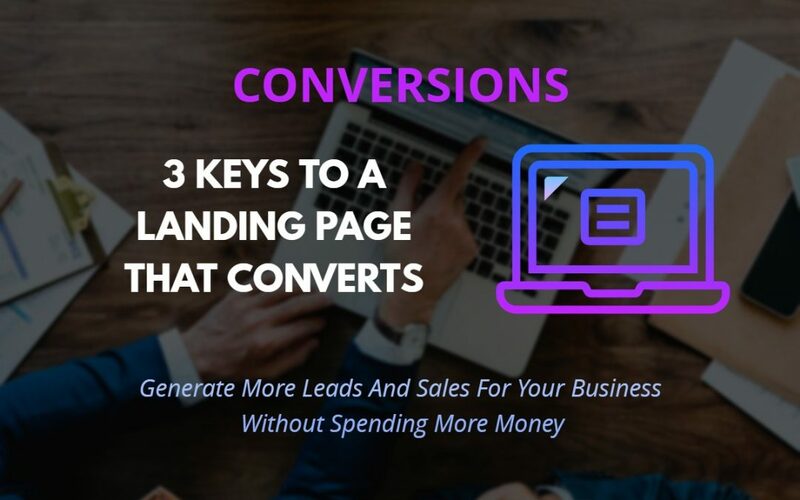 We can’t guarantee those kinds of numbers but we consistently create landing pages that gachieve double or triple the conversion of a typical landing page. Now that we’ve looked at the impact, let’s dive in to 3 easy things you can do to have a high converting landing page. 1. Big bold buttons are a VERY important ingredient of a high converting landing page. You want your buttons to stand out so make them big and bold. They need to stand out from everything else on the page so the color needs to make them “pop”. Of course they should be beautiful as well. Make sure they look like buttons that can be clicked. For that extra impact, give them an animation such as a lift effect or change in appearance when the visitor hovers over them. And don’t stop with just a single button. Place multiple buttons on your page in strategic locations. You don’t want to make your visitor scroll to take action! 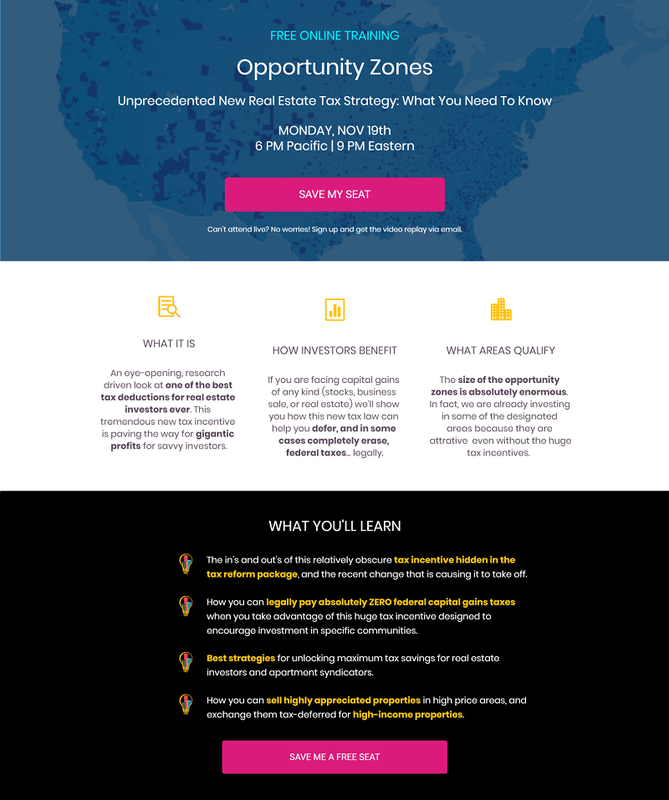 In the Opportunity Zones landing page there are 4 buttons with a color that stands out from everything else. You surely won’t miss them! Most people are going to skim your page. As much as we like to think they will read every word, most probably won’t so the titles (headers) need to tell the story, without the visitor having to read the rest of the text. Make it easy for them and you will be rewarded handsomely. 3. Your offer is the most important thing! Make sure your offer is irresistible. If you want people to convert (buy something, sign up for your email list, etc), you need to give them a way to convert and a reason to do so. You don’t have to give a huge discount on your product to make it compelling but you do need to make the offer copy good and give a good enough reason for why someone should click the button and convert. Get testimonials that are relevant to your offer and add them to your landing page. This helps to build trust with potential customers and is the special sauce of creating a high converting landing page. We can’t emphasize enough the importance of social proof, it is HUGE! Give your visitor a reason to take action today by creating urgency. If the offer is only good for a short time add a countdown timer. If there is a limited quantity, let people know. This article contains very valuable information. Following these guidelines can significantly increase the lead flow from your website. More leads means more business growth and more income! Request a free discovery session and learn how we can help you generate more leads for your business.